You are the winner of this months give-away! Thank you for signing up to follow us! Here is your prize! 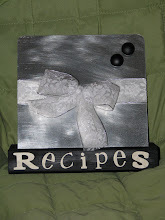 A fun magnetic Recipe Holder! So cute and very fun! Enjoy! Dont forget to send us a picture of how you use it! You have ten days from today to contact us or we will draw another name! Please email us at pepperblossomdecor@gmail.com to make pick-up arrangements! Thanks all who participated! Make sure to keep checking back for our next give-a-way!